Jose Montilla was one out away from finishing six innings with allowing just two runs, but surrendered a total of five runs to give the Blue Jays a 7-4 lead in the top of the sixth. In total, Montilla was tagged with seven earned runs, seven hits and six strikeouts in 5.2 innings pitched. Greg Cullen launched a solo bomb in the bottom of the seventh, cutting the D-Braves deficit to 7-5, but it wasn't enough. Cullen went 2-for-4 on the day with two RBIs, adding to his team lead in RBIs (33). The D-Braves opened the game with a 4-2 lead through the first five innings. Danville recorded four straight hits to open the game. After Michael Mateja was hit by a pitch, Nicholas Shumpert launched an RBI double to right, cutting the lead to 2-1. Cullen tied the game with an RBI double of his own, scoring Shumpert. Henry Quintero gave Danville the lead with a lined RBI single to left. Quintero went 3-for-4 on the day with an RBI, and is now hitting .297 with six RBIs over his last 10 games. The Braves tacked on to their lead in the top of the fourth. Shumpert singled in Carlos Baerga, giving Danville a 4-2 lead. Shumpert finished with a 2-for-5 day with two RBIs. The Denver, Colorado product is now hitting 10-of-27 (.370) in his last seven ballgames. 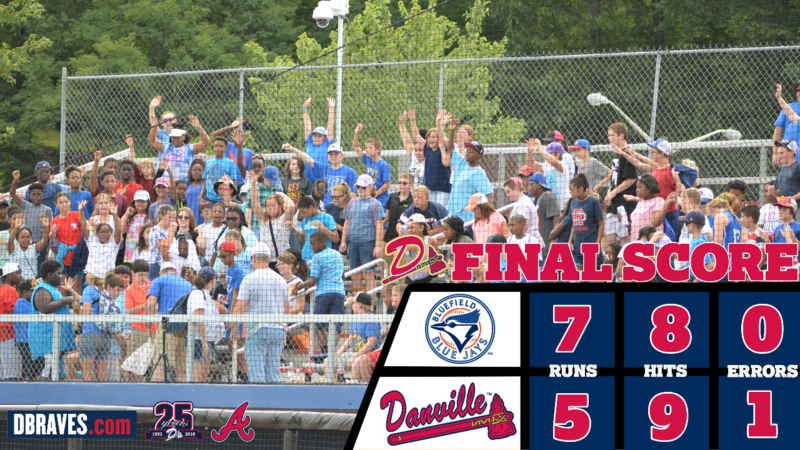 The D-Braves will finish its home schedule with a Thirsty Thursday at Legion Field tomorrow at 7 p.m.